We have a giant comb, a pony, a megaphone, and the mystery mouseketool. 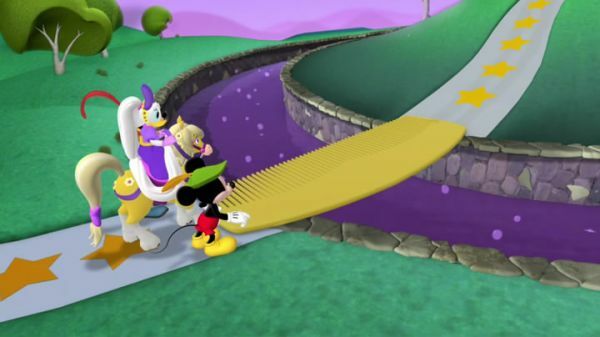 Which mouseketool can carry Princess Daisy along with us? DAISY: Yes. The pony. I can ride the pony! MICKEY MOUSE: We've got ears, say: cheers! DAISY: Oh, she's so sweet. And she has a ponytail, too. I think I'll call her, Penelope! 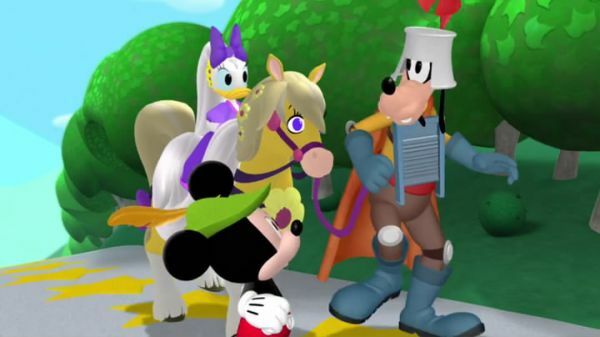 GOOFY: Come on, Penelope, we gotta go to the witch's tower and find the Rapunzel Flower. I made a rhyme. Golly, it sure is quiet around here. DONALD DUCK: Fa-la-la la-la-la, la. DAISY: What's that? 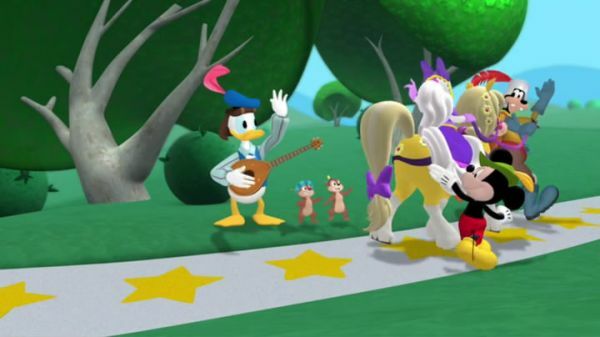 MICKEY MOUSE: It's the traveling troubadours! DONALD DUCK: Fa-la-la, la-la-la, la! 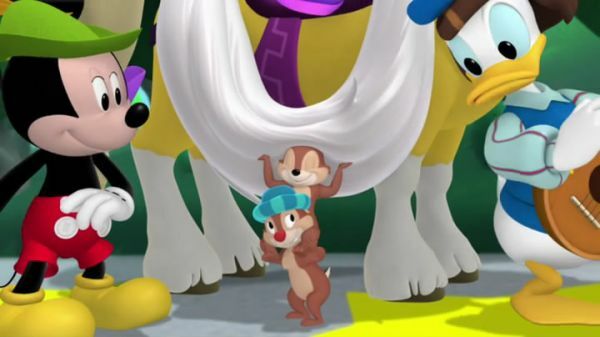 CHIP AND DALE: Princess Daisy is so fair. She needs our help to fix her hair! DONALD DUCK: Fa-la-la, la-la-la, la! CHIP AND DALE: she's on her way to the witch's tower. To find the magic Rapunzel Flower. 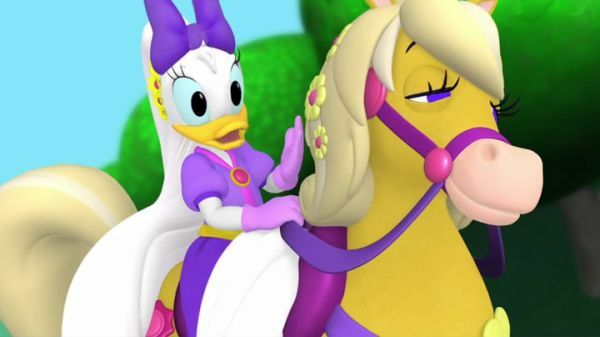 DAISY: Oh, I just love songs about me! DONALD DUCK: Fa-la-la, la-la-la, la! CHIP AND DALE: Just one path goes to the tower. It's there you'll find the Rapunzel Flower. DONALD DUCK: Fa-la-la, la-la-la, la! MICKEY MOUSE: Whoa! GOOFY: Oh, gee. MICKEY MOUSE: It's the witch's tower! DAISY: Oh, no! There isn't a way across this bubbly moat. and we don't have a boat. How will we get to the witch's tower? 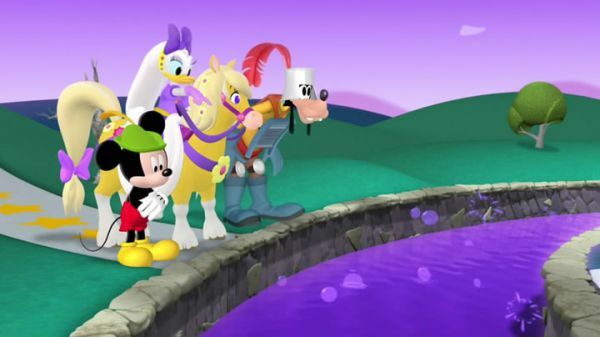 GOOFY: Maybe a mouseke-bubble... Uh, I mean, a mouseketool will help us! MICKEY MOUSE: Good thinking, Sir Goofs-a-lot. Everybody say: Oh, Toodles! ALL: Oh, Toodles! TOODLES: Popping in to help you! MICKEY MOUSE: OK! we have a giant comb, a megaphone and the mystery mouseketool. Hmm... Do you think we could use the giant comb like a bridge? DAISY: Sure! We can walk across it to reach the other side of the moat! MICKEY MOUSE: It sounds silly, but let's give it a try! We got ears, say cheers! GOOFY: Onward to the witch's tower! DONALD DUCK: Fa-la-la, la-la-la, la! CHIP AND DALE: Princess Daisy crossed the moat. She used a comb instead of a boat. DONALD DUCK: Fa-la-la, la-la-la, la! CHIP AND DALE: She's on her way to the witch's tower. Let's hope she finds the Rapunzel Flower. DONALD DUCK: Fa-la-la, la-la-la, la! What are you looking at?